SW Piano Movers are based in South London and have experience in organ moving. 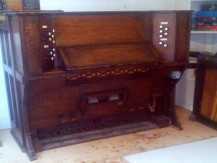 The organ pictured is a reed organ. It's pedals, bellows and foot pedals were detached, and we removed it from a church in Devon and transported it to Inverness in Scotland. Typically, moving an organ requires plenty of time for careful planning, both before and during the move. However, using boards, chocks, trolleys, rollers, heavy plastic sheet and suitable manpower, we will be happy to arrange your move with a minimum of fuss. Instruments are insured in transit from first to last touch (up to a maximum of £10,000). We also have public liability insurance cover. If you need to move an organ you have bought, or are transferring between friends or family, we can help. We carry heavy covers and padded blankets, boards, ramps, piano shoes and skids in anticipation of difficulties and have the experience to move your piano with a minimum of fuss. We have large pneumatic tyred trolleys for easy movement over rough terrain. You can use the enquiry form from the left margin or phoning: 020 7720 0660. SW Piano Movers offer a skilled delivery and manoeuvring service to the public in London and South East England. We also deliver to all areas of the UK and can quote for European deliveries. We work at weekends, which we find convenient for people who cannot be available during weekdays. We maintain all necessary insurances, and you can view our certificates online by requesting a password. Call us on 020 7720 0660 or use this form to enquire about organ moving.